The former Camarillo Mental Institution was built in the 1930's and housed over 7,000 patients form the depressed to the criminally insane. The Billiwack Dairy, known by the locals as the, "Scary Dairy" was built around 1935. Patients were forced to work at that Dairy in the fields, slaughter house, and with live stock as a form of rehabilitation. The local story is the owner of the dairy went crazy killing some of the workers and fed them to the patients. The hospital closed in the 1990's and is now a university. Staff and students to this day have reports of paranormal activity. The dairy closed sometime ago as well. The local police have reported gang activity as well as satanic rituals in the abandoned buildings. Most of the dairy burned down in a fire years ago. My family went there on September 18th, 2009 around 10 pm. The air was warm. There were stars out, but no moon. My niece first noticed her batteries were dead on her camera when we arrived at the barn. Then my boyfriend's flashlight stopped working. We had no light and only my camera was working. The building is brick with no windows or glass whatsoever. I took the pictures with a digital camera a Kinolta 5 megapixel. Out of 25 or so pictures, only 4 had this red mist. Remember the place burned down. 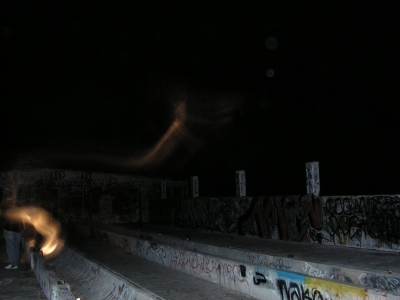 The mist comes out of a pipe and through my boyfriend's back up to the sky and appears to have arms and a face. Long exposure shot. Not paranormal. So what are the humans suppose to be ghosts? Plz!!!! It is amazing I agree with you and if you can't notice that in the 1st pic there is an angry face holding this ghost and this orange spirit is holding something in its hand. I have never believed in ghosts but this is strange and spooky. I know long exposure when I see it. You held down the button too long which captures light at a much slower rate giving it the Ghostu appearance. This is definitely fake. Great photos Shawn. I grew up in Camarillo (*ahem* not the institution!). Now that I'm older and have equipment for ghost hunting, I sadly live many hours away, darn it! The grounds would be a great place to attempt capturing some EVPs or using the Ovilus X device to try to communicate. Growing up, there were lots of scary stories that circulated about the mental hospital, and also the Billiwack Dairy. I believe Richard Senate (Ventura's famous ghost hunter) has a number of stories regarding the "Billiwack monster", reported to have scared many a visitor around the dairy area also. Interesting stuff! My Grandmother, Patty Thomas, used to work at this state hospital until she retired around 1981 or so. She has since past on so I can't ask her about strange things happening there. She would entertain us with the stories of ducking a couple of times as poop was flung by one of the patients. My Grandfather, Carl Thomas, also worked at a dairy close to the hospital, I'm wondering if it is the same one mentioned, I'll have to ask him. Thanks for the post. Wow. If only walls could talk. I think this type of activity exists in all of the old asylums across the country; perhaps it's the restless spirits of the tortured souls that still roam those institutions. I wonder where they will go once they're all torn down. It's a pity these souls can't go to the other side or have someone help them to cross into the light, like they do on Ghost Whisperer. If only it were that easy. 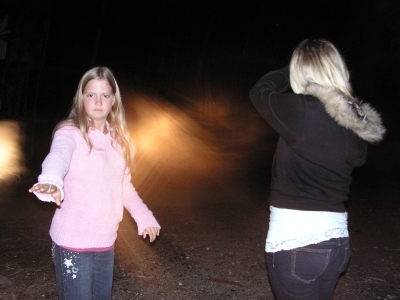 The second photo was taken when my daughter 11 years old told me she getting the chills and felt tingling all over. In fact she was the one who told me to take the picture. Notice how her hand is out in front of her. I really believe she felt what she claims and somehow she reacted quickly enough for me to capture this on my camera.